Soccer teams, at least in the UK, come under financial threat with worrying regularity. Money turns your club inside out, guts it of its most valuable assets –which are what the fans tend to identify with most –and see what can turn a profit while the show still kicks on. According to some, though, there are a select few who still try to turn a profit from the endless cycle of buying up assets with money they don’t have and selling their way to a windfall. In 2010 Liverpool FC’s American owners George Gillett Jr. and Tom Hicks were given the bum’s rush from Anfield as their own board forced them out with a vote of 3 to 2, opting to take on the ownership of John Henry’s New England Sports Ventures (now the Fenway Sports Group). Hicks and Gillett claimed this takeover was illegal and opted to sue for $1bn in damages. The courts in Britain were sceptical about this and to the cheers of thousands of fans in Liverpool the case was dropped as the American’s limped off, tail between their legs. One thing that stood out with all of this was what the Americans had done. Coming in with scarves on, teeth flashing, shooting out rhetoric about the rich history and unique personality of the highly successful club they promised not to “do a Glazers.” By securing no new stadium, racking up debt and offsetting a huge loan taken out by themselves against the club, the two made sure that growth, something any ambitious team needs if it is going through a rebuilding phase, was stunted. The city wept at reneged promises, but marched too. They shouted out. They unfurled banners and protested at the feet of anyone who would listen. They wrenched their club back in a way. The two men were told they were unwanted and that their business practices were abhorrent. No one liked the idea of an ambitious and regenerating club doing badly on the pitch and the new owners not really being too bothered about it anyway. They took exception to the fact that a massive I O U hung over their stadium as the family silverware was being sold out the back. “Doing a Glazers” they called it. They did just that, it had been said by the supporters groups, and they got the old heave-ho. Meanwhile, in 2012, the Glazers, who wake up every day to “do” themselves still own Manchester United, and have since 2005. Back then, the supporters fought the takeover. Like those in Liverpool did at the end, the Man United faithful were doing it at the start. They sensed, or at least this is how they vocalised it, that the Glazers would take out a massive loan to buy up any Red Devil assets and the fans would have to shoulder the burden. They did not want such a successful club having to be host body to any perceived parasitic elements. Some Manchester United fans took such exception to the takeover that they started their own club, F.C. United of Manchester, a lasting protest against ticket price hikes, bandwagon fans and cynical exploitation. They are unique as a club in that every fan owns the club in a cooperative, holding the decisive power of 1 vote in any decision. Protests of a sort still go on. 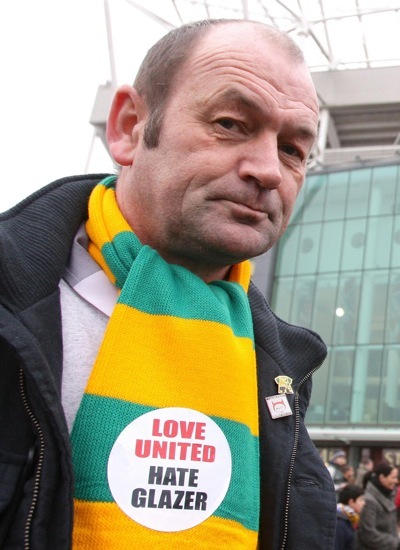 In the last few years, fans have attempted to have their cake and eat it by turning up to games, forking out huge amounts of money to watch United play, but wearing green and yellow scarves –the colours of Newton Heath, the club that spawned Manchester United –and holding polite, quiet protests against Malcolm Glazer’s operation. They sing when they are winning and they mutter the Glazers’ names more when they lose. But will there be cause to sing? United are challengers. It seems they forever will be at or near the top of the English Premier League. 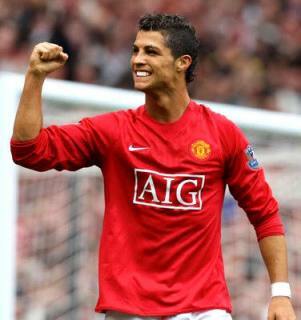 However, if, as it is suggested, large transfer fees accrued by the club for the likes of Cristiano Ronaldo are then used to service the Glazers’ debt rather than reinvest in the club, then they cannot continue without more bitter consequences. Because the club is successful now the continual pay outs by the TV stations, Premier League people, Champions League moneymen and sponsors mask the hundreds of millions of pounds of debt but when success dries up, or the manager finally has enough or the banking crisis gets even worse, will the Glazers cut and run? There is something that other financiers and economy-conscious fans don’t trust about United. Those other fans that are blissfully unaware and enjoying their soccer, even though the team has to recall retired players and is out of the Champions League, will hope that they don’t see the harsh reality of “doing a Glazer” any time soon. This entry was posted in Featured, Pigskin and tagged Cristiano Ronaldo, English Premier League, FC United of Manchester, George Gillett, John Henry, Liverpool FC, Malcolm Glazer, Manchester United, Newton Heath, Tom Hicks by Alan Dymock. Bookmark the permalink. The Glazer’s are giving off the distinct aroma of the Tampa Bay Bucs late (but not so great) owner, Hugh Culverhouse. Their reputation is so bad they are having a hard time hiring a new coach or attracting valuable free agents. Good luck to Man U and if you have a moment say a prayer for our Bucs. I’ll have my counterpoint from the American perspective up soon. Stay tuned, I think you’ll dig. Ironic this piece came up as I was taking in my first real action (ever) of Premier League soccer. I have always been a World Cup-only (i.e. once every four years) soccer viewer but allowed myself to take in 3 – count ’em 3 – EPL games this past weekend. And I enjoyed it…as I am sure I will the “American view” to this post on financing/sports ownership. 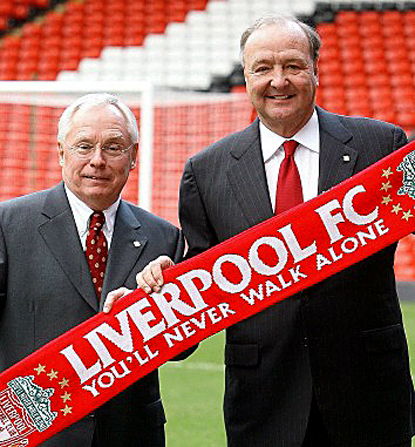 Hicks and Gillette owning Liverpool would be akin to having Ken Lay (Enron co-founder) running a power utility . These two as#holes have brought or seen all of their sporting interests in the last five years close to the brink of bankruptcy . Stars in the NHL , Rangers in MLB , prior to their sale to Nolan Ryan & partners ____ and also the premiership team Liverpool ..
Now with independently wealthy Stanley Kroenke owning Arsenal I can’t wait to see what’ll happen with that organization as the fans are looking to apportion blame concerning team’s faltering progress in the EPL this season ! The manager is Arsene Wenger has been one of the most successful coaches in Premiership history but Kroenke now seems intent on running the team as if it were a “Ma and Pa outfit” ….. tightening the payroll while upping ticket prices and not wanting to spend money on players to compete with the likes of Chelsea , Man City and Man Utd . Kroenke s married into the Walton family (Walmart founders ) dynasty . to one of, . US businessmen owning sports’ franchises abroad has been a complete joke ! Look at the financial mess that Man U still finds itself in with the Glazers ? Anyone who feels that family has been of benefit to that club must be a real nut-job ! They’ve got a burgeoning debt and they’re still want their creditors to allow them to issue further shares in order to try and pay down that debt …… never mind the mess stateside concerning the Bucs . That’s still not something that has reached my living room yet. I was hoping Dymock would be able to convince me. And look what Ryan and Co. have done with the Rangers, Al. Two straight World Series and they’re reloading for another. And why is it that Major League Baseball is still keeping Mark Cuban at arm’s length. I mean, how much worse than McCourt could he possibly be? That’s the way it works over here, Harry. Has for a while now, with perhaps the Green Bay Packers as the only exception.